Mountainside Inn 419 is offering accommodation in Telluride. All rooms boast a kitchenette and a private bathroom. 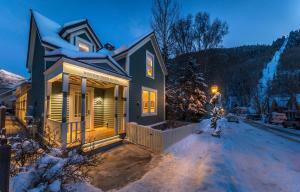 The property is 700 metres from Sheridan Opera House and 500 metres from Telluride Free Gondola. The units in the hotel are fitted with a coffee machine. Guest rooms will provide guests with a microwave. Oak Street Lift is 500 metres from Mountainside Inn 419. Montrose Regional Airport is 111 km from the property. When would you like to stay at Mountainside Inn 419 ? This apartment features a toaster, microwave and washing machine. Guests are required to show a photo identification and credit card upon check-in. Please note that all Special Requests are subject to availability and additional charges may apply. Guests must be 21 years of age or older to check-in. Each day we'll check prices and send you an email for your selected dates at Mountainside Inn 419. If you don't have specific dates but would like to check prices for say next weekend or say next month we can check the price too. Click to write a review and share your experience of Mountainside Inn 419 with other travellers.